WASHINGTON, DC, September 9, 2013 (ENS) – The U.S. 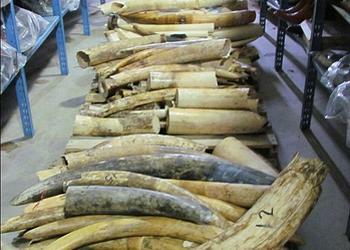 Fish and Wildlife Service plans to crush and destroy six tons of elephant ivory seized by its special agents and wildlife inspectors for violations of U.S. wildlife laws, Secretary of the Interior Sally Jewell announced today at the White House. The ivory “crush” is part of a series of upcoming coordinated actions that will spotlight the rising tide of poaching and trafficking that is threatening wild populations of elephants, rhinoceros and other species and strengthen global efforts to crack down on these criminal activities. The Service plans to destroy the confiscated ivory, which is being held in secure storage at the agency’s National Wildlife Property Repository near Denver, Colorado, on October 8, 2013. 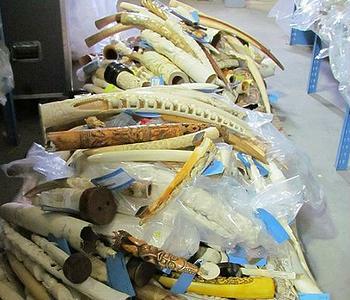 The material to be crushed will include raw and carved whole tusks, smaller carvings, and other elephant ivory items abandoned or forfeited to the Service as a result of its criminal investigations in the United States and overseas, as well as its anti-smuggling efforts at U.S. ports of entry over the past 25 years. The agency is also reviewing its existing regulations and policies and will propose several changes in the coming weeks designed to close loopholes that currently make it easier for criminals to smuggle ivory and other wildlife products in violation of U.S. and international law. In addition, the Service is stepping up efforts to train game officers, customs officials and police across Africa, Latin America and Asia, and to provide equipment and other logistical and technical support to build the capacity of range countries to combat trafficking and poaching. Fish and Wildlife Service Director Dan Ashe, who attended today’s White House event and will oversee the Council’s activities, noted that the ongoing slaughter of elephants and other species is not an issue confined to Africa. An estimated 11,000 forest elephants were killed in the past decade in just one park – Gabon’s Minkebe National Park – and the total population of forest elephants is down by an estimated 62 percent in those 10 years across the Central Africa zone. Elephant massacres have taken place in Chad, Cameroon, and the Central African Republic in the past year, as well-armed and organized criminal enterprises have taken advantage of insufficient protection capacity in remote landscapes and the rising price of ivory on illegal markets. The Fish and Wildlife Service will provide more than $8.6 million in support this year through its Wildlife Without Borders Multinational Species Conservation Funds for 171 projects benefiting elephants, rhinos and tigers, and great apes. This funding will be matched by $14.3 million from foreign governments and nongovernmental organizations. Many of those awards will be made in the coming weeks to help address the poaching and trafficking crisis. Ashe said people who want to contribute to protection of species at risk can purchase the Save Vanishing Species semi postal stamp at their local post office or online. Sales of the stamp, which costs a few cents more than first class stamps, have raised nearly $2.4 million to support the U.S. Fish and Wildlife Service’s Wildlife Without Borders programs since the stamp went on sale in September 2011. Thirty-three conservation projects in 23 countries have already been funded with $1.3 million of stamp proceeds, with more to come. Secretary Jewell also announced the members of the Advisory Council to the Presidential Task Force on Wildlife Trafficking. As directed by the Executive Order on Combating Wildlife Trafficking that President Barack Obama signed on July 1, the Advisory Council consists of private-sector leaders, representatives of nonprofit organizations, and former government officials, who will advise and assist the Presidential Task Force as it develops a national strategy for combating wildlife trafficking. The Advisory Council will be chaired by Judith McHale, president and CEO of Cane Investments. McHale is a former Under Secretary of State for Public Diplomacy and Public Affairs. Appointed by President Obama, she served from May 26, 2009 to July 1, 2011. She is a former president and CEO of Discovery Communications, the parent company of the Discovery Channel. Despite the 1989 ban on commercial ivory trade in the U.S., recent seizures and busts in the country show that the United States remains a major destination for illegal ivory. Destroying the ivory stockpile sends a crucial message that ivory is not acceptable as art – nor jewelry, carvings or trinkets. “The U.S.’s leadership two decades ago in limiting domestic trade in ivory prompted action from others around the world,” said Jeffrey Flocken, North American regional director with the International Fund for Despite the 1989 ban on commercial ivory trade in the U.S., recent seizures and busts in the country show that the United States remains a major destination for illegal ivory. Destroying the ivory stockpile sends a crucial message that ivory is not acceptable as art – nor jewelry, carvings or trinkets. “By crushing this ivory stockpile, the U.S. government is sending a signal. If we’re going to solve this crisis we have to crush the demand, driven by organized crime syndicates who are robbing the world of elephants and stealing the natural heritage of African nations,” said Carter Roberts, president and CEO of World Wildlife Fund in the United States. “It’s a global phenomenon. So we hope this encourages other governments to take bold, decisive steps to curb the demand for illegal elephant products,” he said. Roberts has been chosen to serve on the Advisory Council. Tod Cohen, vice president and deputy general counsel of global government relations, eBay Inc.